Spencer Clark, Jan Anderzén and Floris Vanhoof toured Europe -as a band-, promoting the TARZANA album "ALIEN WILDLIFE ESTATE" out on Pacific City Soundvisions. 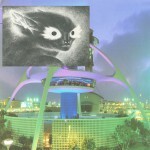 "Tarzana's sound groups a long five year collaboration between musicians Jan Anderzén (Fonal, Kemialliset Ystävät, Tomutonttu) and Spencer Clark (The Skaters, Pacific City Soundvisions, Monopoly Child Star Searchers). A space ethnic alien hyperdimensional ooze is here, brought into a live setting with the addition of belgian synthesist composer Floris Vanhoof (Kraak, Ultra eczema), who, in Tarzana, will be playing free sampladelic drum pads." 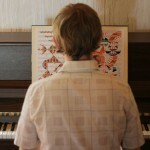 Jan Anderzén is an artist based in Tampere, Finland producing experimental music and creating images with various techniques. He layers plotted and formulated elements with splashes of accident and contingency. He often focuses on themes roaming the foggy borderlands of wild and domesticated. For the past 20 years Jan Anderzén has been the main pilot of the band Kemialliset Ystävät. Tomutonttu is a creature who looks after all the dust and in a solo mode Anderzén makes the music of Tomutonttu audible. A detailed close­up of music, a microcosmos of strange sound events and dirt flying around in stereo space, interacting with a logic all of their own. Anderzén is actively performing around the world and his discography is a labyrinth reflecting the nature of his art. Spencer Clark is using top­-of-the-­line music imaging keyboards from the 80's and 90's to produce hallucinations of Past and Present Juxtaposed Eras, Far­Off exotically composed tropical maladies, and wondrous inner­-outer Ouspensky driven Fourth Dimensional Landscapes. After having collaborated with James Ferraro in the Skaters, Clark recorded albums with a host of young modern musicians including Ducktails, Jan Anderzén of Kemialliset Ystävät, and Orphan Fairytale. His label Pacific City Sound Visions has ejected Cassettes, Lp's, and Private Movies for the past 8 years. The labels latest release: Tarzana's - "Alien Wildlife Estate", is a collaboration with Jan Anderzén, coming out in late October. 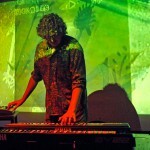 Connecting his many worlds, ideas and influences into highly personal live performances and recordings, Floris Vanhoof keeps on amazing people here and abroad with his combo-style of both highly-original visual performances and oddball modular electronics. 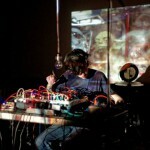 After his vinyl debut on Ultra Eczema, he presented his second outing on wax on the Kraak label and "De Karekiet van Karakas" a split LP with Keith Fullerton Whitman.On his latest live performances Floris Vanhoof (Belgium, 1982) presents 'An extension of our nervous system by electronic circuits and projected lights'; biofeedback with brainwaves control a hybrid form of projected images and music produced by a modular synthesizer.